Amongst others, human geography studies the interrelationships between people, place and their environments. Loneliness is a function of place. Direct face-to-face communication is an important way of building meaningful connections, which reduce loneliness. However, direct face-to-face communications requires individuals to be in one place. Therefore, the ability for two individuals to be in the same place influences the ability to form meaningful connections and reduce loneliness. Place can be considered in a wider context. Place brings with it culture. Where a senior lives – and their feelings of safety and a sense of belonging or not, influences their wellbeing. How they view people in the place around them, influences their ability to connect with people, and therefore increases or decreases their loneliness. The greater the number of meaningful relationships that any person has, the smaller the risk of abuse and harm. So especially when a senior is in a new environment, they need meaningful relationships with others external to the new place, who they can confide in and who can help them reason through their experiences; and at the same time it is important they build up meaningful relationships with people within the new environment that they can begin to trust. Sarah Wright (2015) identifies workplace loneliness being both an individual variable, and a property of the organisational context. She adds “the organisational climate can operate on the individual causing, exacerbating or perpetuating loneliness”. In a scenario where we are looking to have increasing numbers of seniors remaining in the workplace, feeling accepted and able to develop meaningful relationships becomes important. Improving workplace culture is more than doing away with ageism; its embracing that at all ages we contribute different strengths to the organisation. Ageism works both ways – for young people to build meaningful relationships with older people, they too need to feel accepted and trusted by seniors. Given that life is experienced quite differently by each generation, effort to find commonalities, rather than focusing on differences, is required for true understanding. Social isolation is when you do not interact socially with others. It may or may not be associated with physical isolation or place, but often is. You may for instance be amongst family members and yet contact no one outside the home, or you may be living alone. Sometimes people do not socialise by choice because they are satisfied with their own company. Others might say not socialising is their choice, but given the stigma they perceive associated with loneliness, they will not admit they have already become chronically lonely, and they are in fact withdrawing – in some situations they have become emotionally isolated. We are a social species so for the vast majority who become socially isolated, and crave the company of people, addressing social isolation is important. While social isolation is not the same as loneliness, being socially isolated over a period of time can lead to loneliness. Socially isolated people not only have reduced numbers of people to engage with, they have reduced opportunities to create meaningful relationships, which are core to reducing loneliness. 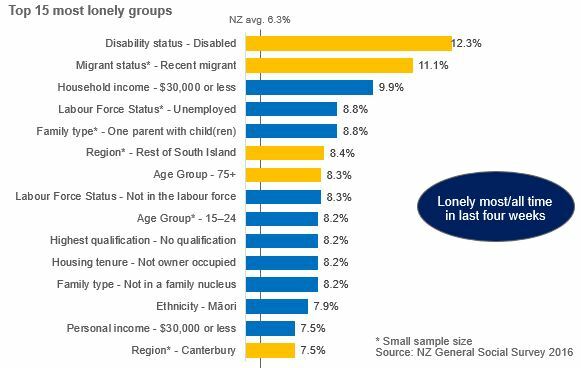 When we examine the top 15 most lonely groups, the loneliness of five groups (shown by yellow bars) are partially a function of place; and because of the constraints of place have given rise to greater social isolation. In particular, some of the disabled may be mobility constrained (sometimes stuck in the same place for long periods of time, or sometimes unable to access the same places as people without disability). Further, recent migrants have recently moved from their family and friends – being in a different place to where their meaningful relationships took place, and being in a different culture. The ‘Rest of South Island’ is a rural group, which for many their place is physically separated by quite some distance to get to their nearest family and friends. Seniors aged 75+ increasingly suffer from deteriorating health and disability, reducing the frequency of leaving their home. Canterbury is another rural region, which after the Christchurch earthquakes caused many people to be displaced from homes and workplaces where they socialised and had meaningful relationships. With social isolation and the capability to use technology such as the internet, many seniors see the value of Skype and the internet generally, as a tool for connecting (Barke, 2017). Others, potentially already so lonely that they tend to perceive the negative only, feel more excluded or disconnected; or have that attitude even before using it, so will not learn to use it. For those that do use social media and the internet, how it is used will determine the extent to which it helps alleviate social isolation, and loneliness. The part of the brain that has the feel good factor social reward comes from being in touch with others. Seeing the positive in what others share, or being part of a wider group, temporary helps alleviate feelings of social isolation. For these people, the short-term reward of having some people connection is better than no interaction. However for those that do use the internet as a primary form of social connectedness, studies have shown that excessive and unhealthy internet use would increase feelings of loneliness over time (Yao and LZhi-jin 2014). So adding more and more contacts does not add social connectedness value. They found online social contacts with friends and family were not an effective alternative for offline social interactions in reducing feelings of loneliness. Furthermore, while an increase in face-to-face contacts could help to reduce symptoms of internet addiction; this effect may be neutralized by the increase in online social contacts as a result of excessive internet use. From an ageing well perspective for seniors, social interactions with family and friends using technology still needs to have meaningfulness to minimize loneliness. So how conversations are held, how much is shared and withheld, and tone of voice are all-important. As our more technology-savvy New Zealanders age, the internet use will already be high. Note that seniors using the internet as a primary way of having social connectedness may be a sign that they have already withdrawn from fostering meaningful relationships with people closer by. Barke, Jenny (2017): “Community-based research and approaches to loneliness prevention”, Working with Older People, vol. 21(2), p. 115-123. Morrison, Philip (2011): “Local expressions of subjective wellbeing: The New Zealand experience”, Regional studies, vol. 45(8), p. 1039-1058. Smith, Rebekah (2015): “Loneliness, connectivity, and place in New Zealand”, Master’s thesis. Victoria University of Wellington. Yao, MZ, and Z. LZhi-jin (2014): “Loneliness, social contacts and Internet addiction: A cross-lagged panel study”, Computers in Human Behavior, vol 30, p. 164-170.